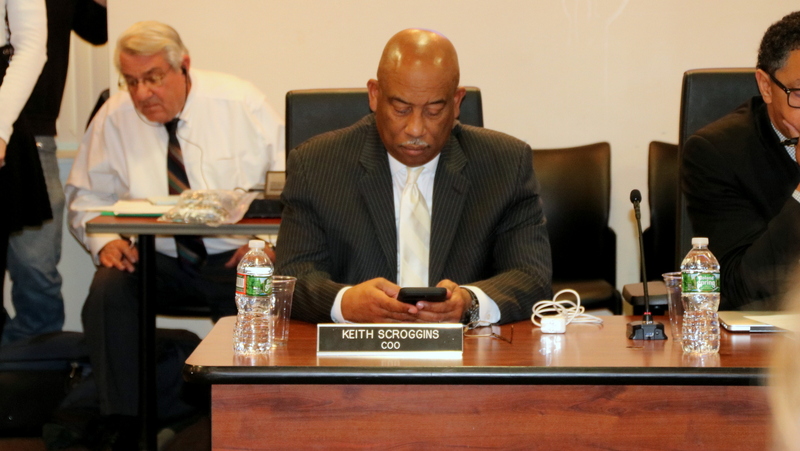 Saying nice things about outgoing board members, allowing them to look back on accomplishments – it would have been no big deal at a normal Baltimore School Board meeting. 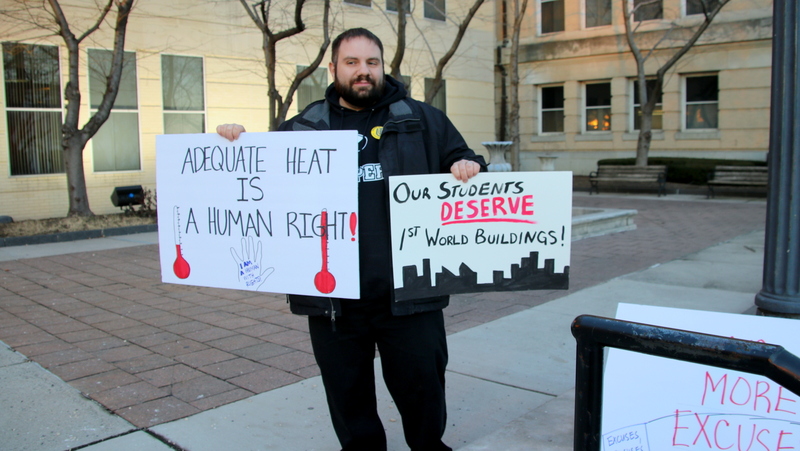 But the furious, sign-waving people packing this meeting wanted to talk about the near-freezing conditions that students were subjected to last week in buildings allowed to deteriorate over decades. And about lead-tainted water fountains. And about lack of transparency. For the first hour, the commissioners at the front of the room honored and thanked outgoing chairman, Marnell A. Cooper, and fellow departing school commissioner, Tina Hike-Hubbard, for their service to children. But, finally, the people in the back of the room exploded Tuesday evening. “Oh, come ON!” some shouted loudly, interrupting Schools CEO Sonja Santelises in the midst of her emotional remarks to departing colleagues. “EXCUSE ME!” Santelises shot back, livid, bringing the room to silence. 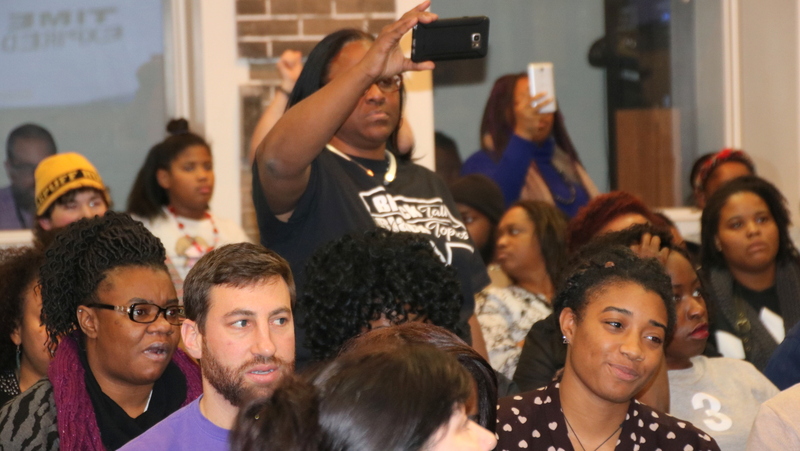 “You will have an opportunity to speak,” she said, noting that this was a regular board meeting and that a three-minute-apiece public comment period was later on the agenda. “It is rude and disrespectful to service to undermine what is an acknowledgement of service,” she chided them. The school system had turned off the live feed to the overflow rooms during the parents’ outburst. But the feed was turned back on for Santelises’ reply, according to Baltimore Fishbowl. What followed was a meeting that veered in and out of control over the course of nearly three hours. The announcement of a subsequent meeting on January 22 mollified few. “You don’t know how we feel,” one parent screamed, her voice ragged. “I took up for you! I took up for you! I said, ‘Mmm, she might be cool, but I don’t know,’” another said, addressing Santelises. Santelises tried to resume, but she finally gave up in the face of the fractious crowd and the unique situation – one of the school system’s worst public crises in years. 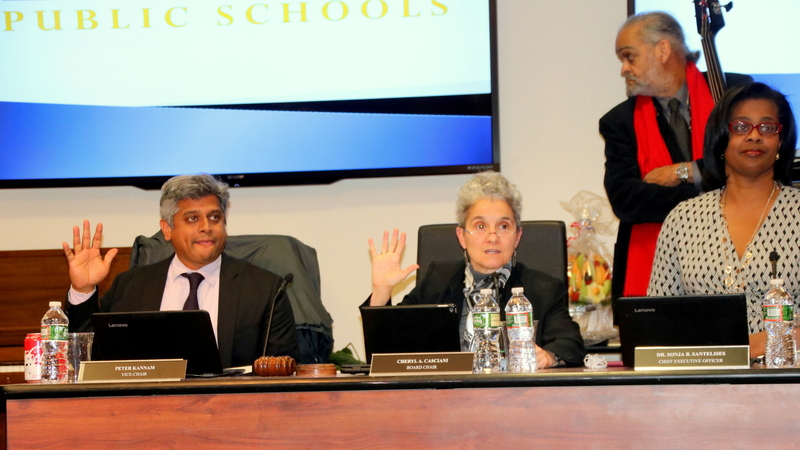 School Board Chairwoman Cheryl A. Casciani announced she would take the agenda out of order and allow the public to speak. Activist Kim Trueheart led off. She directed her ire at Gov. Larry Hogan, criticizing state funding rules that favor wealthier jurisdictions able to forward-fund school facilities projects. 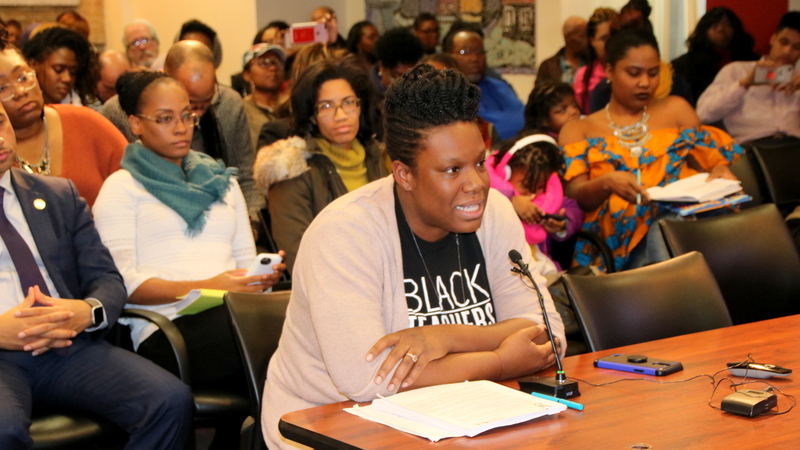 Khalilah Harris, a city school parent and former Obama administration official who who works in education policy, said she is part of a grassroots group of educators developing a racial equity plan for schools. “The school facilities are a symptom of lack of equity for our children,” Harris said, going on to fault school officials for not finding the money to fix the system’s aging, dilapidated facilities. “We can’t wait for you to tell us what’s going to happen any further because you all don’t seem to have a level of urgency for our children,” she said. 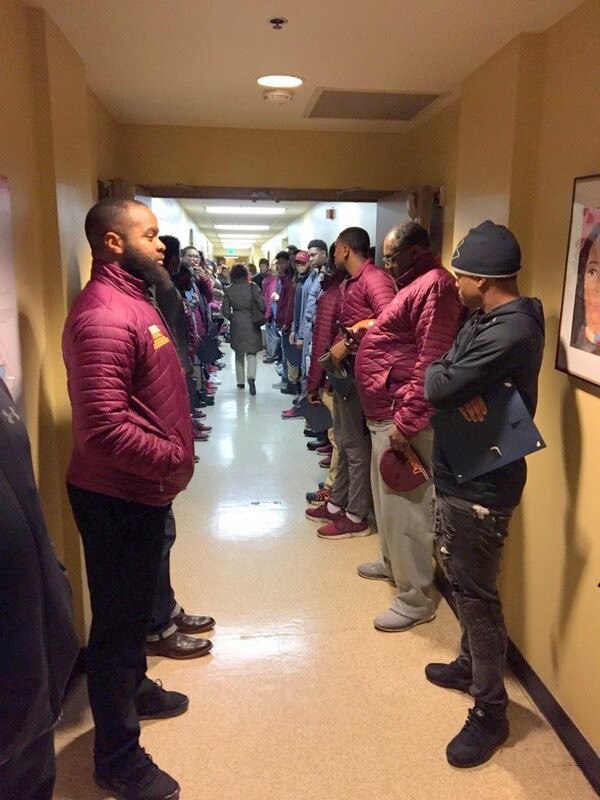 “An impressive number of Dunbar young men are in the house here at the @BaltCitySchools board meeting,” tweeted @KarenDeCamp. 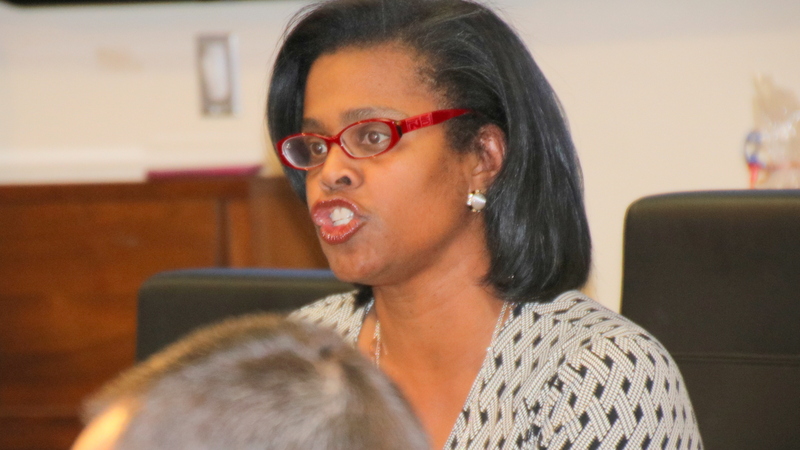 City school teacher Cristina Duncan Evans said responsibility lies not just with Annapolis leaders, but with North Avenue administrators and board members. “We have not done . . . a good enough job of calling out the people who are not our friends,” she said. Duncan Evans, who teaches at James McHenry Elementary/Middle School, said she represented the teachers’ group BMORE (Baltimore Organization of Rank-and-file Educators) that has presented the school system with a petition signed by 1,500 people. The petition calls for students to be guaranteed classrooms that are warmer than 60 degrees and for principals to be empowered to check temperatures and close their schools if conditions warrant it. Implored to close school last Tuesday and Wednesday when some teachers reported classroom temperatures in the 30s and 40s, Santelises kept most of them open. “You don’t know how it feels to see my granddaughter go into a cold school and have to try to learn,” one woman said. 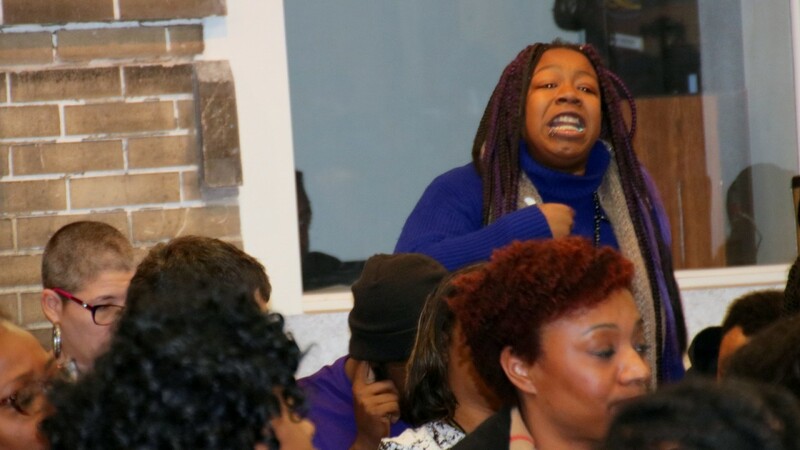 By the end, as activist Tre Murphy began asking questions and refusing to step away from the microphone, the meeting again spun out of control. “We need $3 billion just to bring the buildings up to standards,” said Murphy. “I’m not interested in talking about how much you guys have done a good job as public servants. I’m interested in figuring out what are your solutions,” he said. “We messed up. We are cleaning up. But our mess up is not the only mess up. We have seen decades of mess up and a lot of it is connected to funding,” she said. She also lashed out at the media, charging that some of the coverage has been racist. “We know the reasons why the narrative is always about incompetence in the city of Baltimore, and it is obviously linked to the demographics of the city,” Santelises observed. While some were inside trying to hold officials responsible, other were outside seeking to elect new officials. “If people don’t go to the voting booth, none of this is going to matter and we’ll never have meaningful change,” said Shamoyia Gardiner. 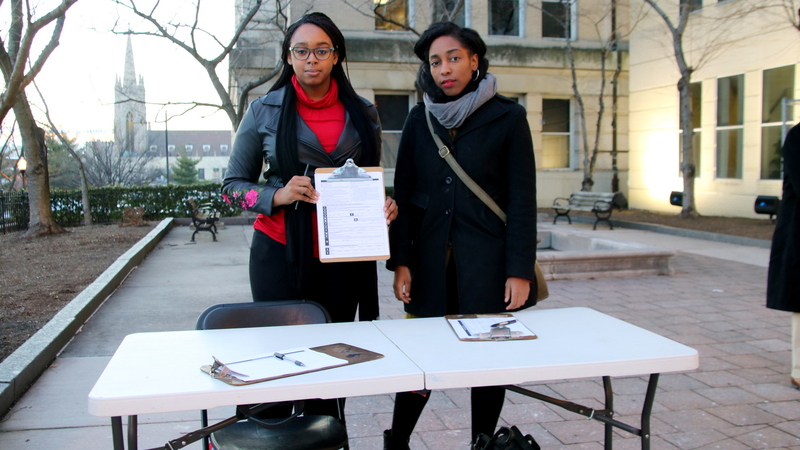 Gardiner and Brittany Oliver, of the group Not Without Black Women, set up a voter registration table outside the building. The temperature in his classroom last Tuesday was 43 degrees. Asked who he blames, Pesa said he holds adults from Annapolis to Baltimore responsible for the inhuman conditions.